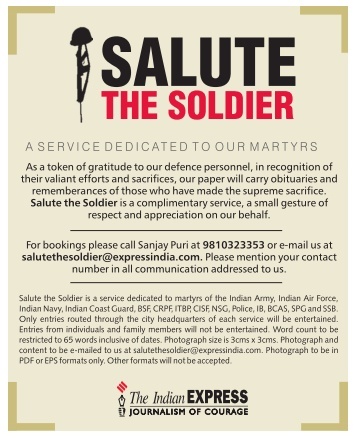 In a small advertisement on page 4 at the bottom of the page, extreme right, the Indian Express advertises a “complementary service” to carry obituaries of our nation’s martyrs – for free. Of course the paper itself shall “earn” some good name from those of us who are taken in by such generosity. I don’t think this gesture is noble. I think this makes our martyrs’ families look cheap. There is no reason why it should have been advertised.